Immerse yourself in Dangerous Lagoon, our breathtaking underwater gallery, and come face to face with some of the Aquarium’s most jaw-dropping species. 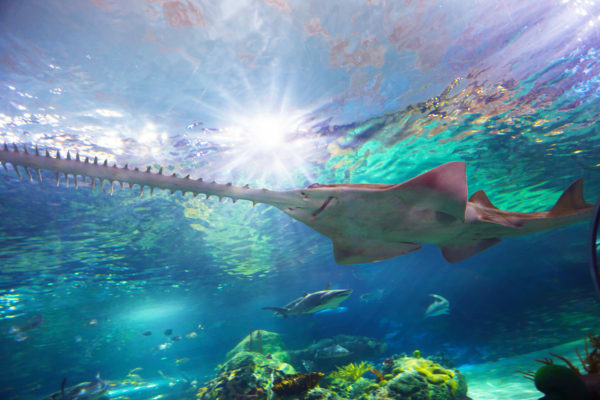 Hop onto our moving sidewalk and get up close and personal with a wide array of sharks while keeping your eyes peeled for our two resident green sea turtles, green sawfish and other species of fish and invertebrates who call this exhibit home. Take a look at our very own Shark Cam! Green sawfish are more closely related to stingrays than sharks. They are a modified ray with a shark-like body and can grow over 15 feet in length. Their rostrum, or “saw,” is edged with teeth and can comprise up to 30% of their length! Their rostrum is an efficient weapon, used to detect, stun and kill prey. 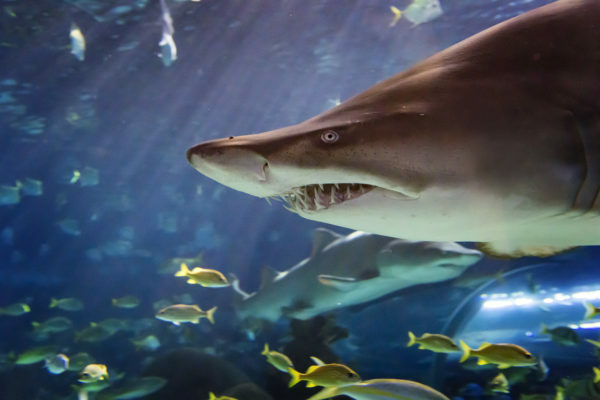 Despite their ferocious appearance, sand tiger sharks are a relatively docile species. Sand tigers are the only known shark that can gulp air. They use this air to help regulate their buoyancy and float motionless in the water, making them a very efficient predator! 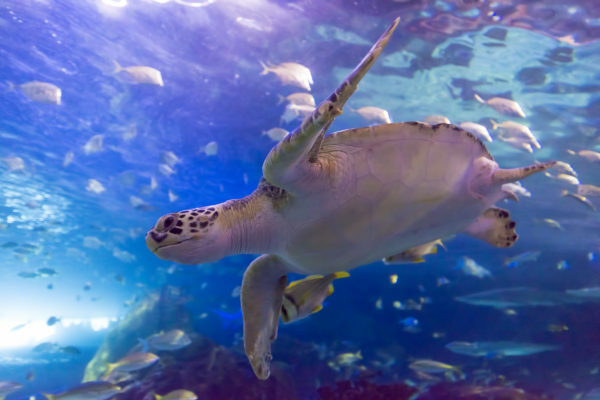 Green sea turtles are among the largest of the seven species of sea turtle. They can cross entire oceans on annual migrations of 2,000 kilometres or more. Be sure to stay on high alert while exploring Dangerous Lagoon as many guests have a hard time spotting our mysterious green sea turtles! 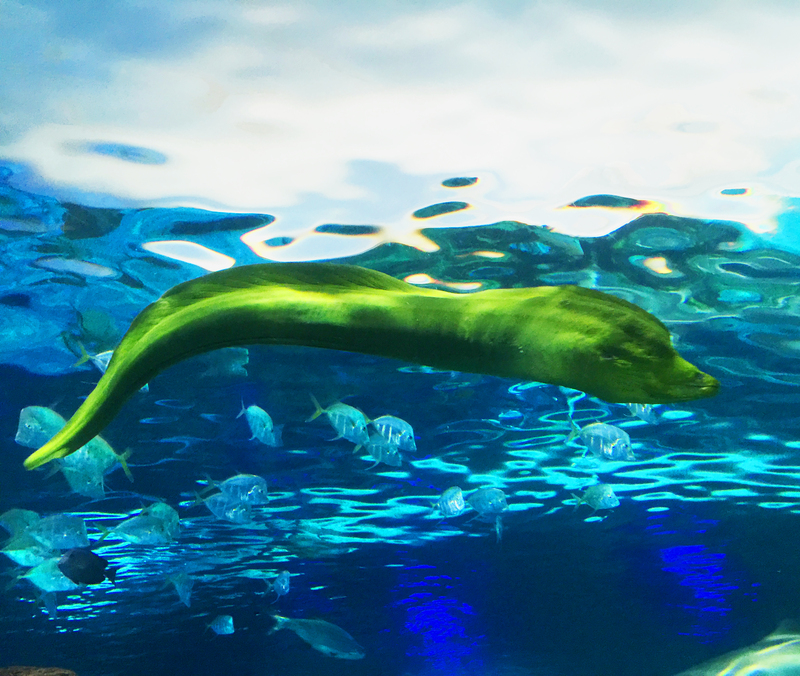 Green moray eels are solitary creatures that hide in rocky crevices during the day, emerging at night to hunt. Powerful predators growing up to 2.5 metres long, they are actually a blue-grey colour but are covered in a layer of yellow mucus that protects them from parasites and gives them their green tint. Lookdowns get their name from their odd facial appearance! 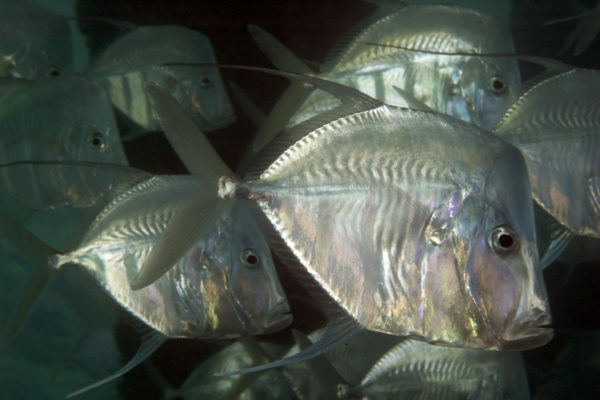 From the side they look like a shimmering, silver broad shaped fish but from a head on perspective they seem to disappear. They are extremely thin and rely on this “shape shifting” to camouflage themselves from predators. These fish are truly giants! 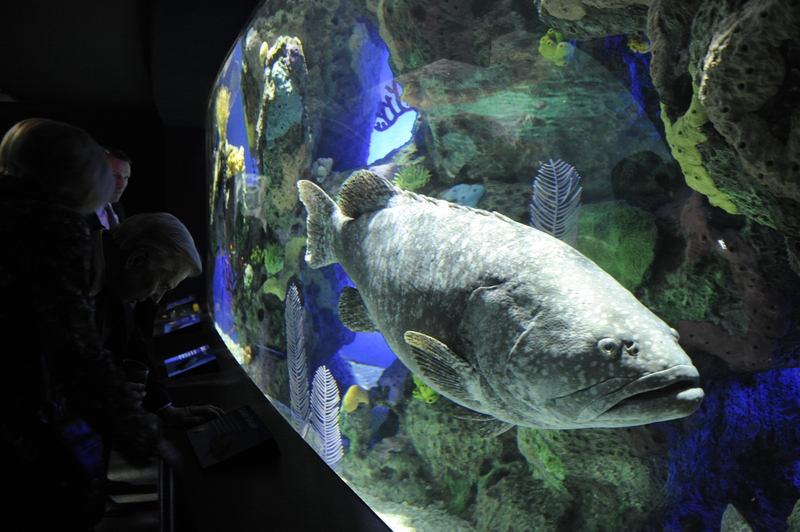 Weighing in at up to 400kg, Queensland groupers are the largest reef-dwelling fish in the ocean! Their large size makes them slow swimmers and as ambush predators, they often stay put in order to surprise their prey. 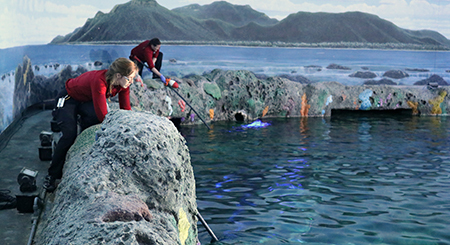 • Dangerous Lagoon is our largest exhibit at approximately 2.9 million litres of water! • Dangerous Lagoon is home to the longest moving sidewalk in North America! 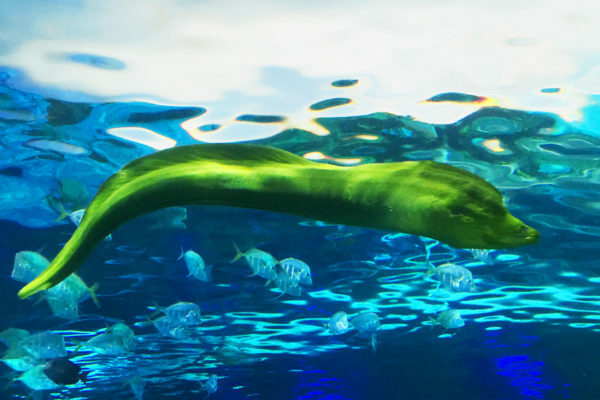 Hop on and come face to face with a wide array of species as your journey under the sea. • Experience Dangerous Lagoon from a different perspective! Participate in our Discovery Dive program – go on a 30 minute guided dive and swim with our sharks, all while supporting shark conservation. Tweet us your best #SharkSelfie to @RipleysAquaCa for your chance to be featured!